Do you happen to remember the little issue this summer in the tropical pathway. Nothing serious. The impatiens decided to seed themselves all around the seating area and then they grew up and kinda-sorta took over the seating area. I didn't have the heart to clear them away even when they began to block the passageway. They were just so easy and I figured who was I to get in the way of volunteers that meant no harm? Eventually much later in the season I did pull them all out by the roots. I know. It pains me to say it but they got leggy and well, there was just no pathway left for passage until they were gone. I was just saying this week how very much I appreciated all the impatien volunteers that are taking over the front area. I removed the last of the lawn there last spring and replaced it with Florida native mimosa strigillosa. Only I think it isn't getting enough sun so I'm not totally satisfied with its appearance. But that's another story. Impatiens have randomly plopped into that spotty area with no help from me. My have they made a nice interim show through fall and winter. You might not be able to tell in the above photo but there is plenty of room in the pathway between these impatiens and the seating area. After the freezing temperatures expected tonight I am fairly certain they will turn to mush by morning. I will miss their cheeriness and their hardy ability to survive all on their own. Unless it freezes of course. They just can't take low temperatures. 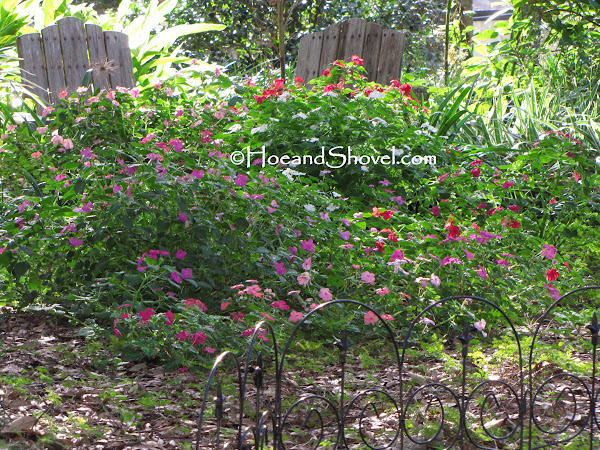 I love volunteers and your impatiens have been giving you a lot of beauty this year all on their own. They certainly do turn to mush when it freezes. Impatiens are the first to go in my garden. They are cheery hard workers in the heat of summer. Volunteers are always so welcome to a gardener especially the ones we like so much. It doesn't take too much to kill impatiens. Mine in the window box always turn to mush the first cold night. Glad your beloved impatiens made it through the freeze, Meems! I've never been able to even try those -- too much sun. My sunny answer to impatiens is blanketflower, bless their colorful, cold-tolerant, drought-loving souls. My impatiens were all laying flat this morning, deflated by the freeze. They really are cheerful, lovely things. I'll miss them, too. I can't wait for spring!! Hi Meems, Happy New Year! Yes i fully remember that post and photo, and being also very familiar with impatiens i very well relate to what you experience. And I am sure, even if you have uprooted them fully, and the rest frozen, you will eventually be seeing lots of them again. They are not as vigorous here, however because we are drier and hotter! Oh but we know they will be back! Our cold spell definitely dipped below freezing and then the second night we had blankets of frost on the lawn. But I'm telling ya, people, my trees are my heroes. The impatiens and everything in the front yard did NOT succumb to the cold. The trees become their blanket. It's too bad the weather prognosticators have to be so dramatic about these cold weather events in FLorida. A 'hard' freeze for hours is kind of overkill! No pun intended. :-) Have a happy week in your gardens!